Kaart 03 " Zebra feest"
Kaart 07 "Op het strand"
7 New postcards for little children and big ones! In this postcards package you will find 2 different series that belong together. You'll find a series of postcards where 4 animal friends have something to celebrate; a giraffe, two small zebra and a small cow! What will they have to celebrate? In addition to these 4 animal friends there are 3 cards that belong together. 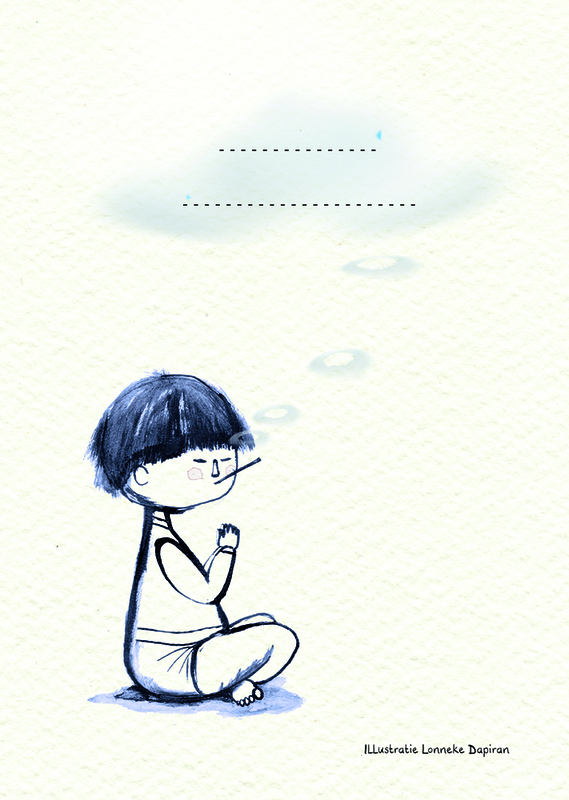 You'll find two little Chinese men; one meditating with his cigaret, the other one flowing thoughts out of his cigarette. On the last card we see a couple on the beach, looking at an ...apple? What will they all think? Surprise a friend by sending your thoughts on one of these cards! I made the original illustration by hand and worked in the computer. Colors I used: black, blue, soft blue, soft brown, yellow, green, orange, red. Materials: ink, watercolor, pencil, acrylic. - Single-sided, back printed with line and stamp drawing.